Some people are surprised to discover that I’m seriously interested in softsynths. I’m a Max guy, right? Don’t I just patch everything I need? The short answer is, “No.” I’m generally interested in using Max to do the things that are what Max is really good at - at least in my opinion. For me, that's about interconnection and control, getting diverse bits of software to talk to each other, and creating ways to generate and organize variety in a performing system or a piece. When the quickest and most efficient way to do that is to create a huge Max patch, I’m there. But while I am a strong believer in the kind of serendipity of walking the path of the developer (and honoring my errors as hidden intentions) and leery of the false economy of having others do my patching for me, there are times when making use of the work of others just makes good sense to me and to my eyes and ears. I’m grateful so often for the vst~ and amxd~ objects, and the hosted goodness they’ve brought to my life. A really really good sounding softsynth a great example of hosted goodness – when an genius or enthusiast has expended real time and love on something that sounds much better than what I’m working on - or what I'd be likely to do were I so inclined - I feel no shame in bolting ‘er to the rig and taking it up for a test flight. The modern software world is full of examples or those options - in particular, emulations or recreations of the subtractive softsynths of the 1980s. I appreciate the variations in the range of virtual subtractive softsynths out there – you can choose one whose programmability or UI layout pleases you or makes the most intuitive sense, and then get down to making some noise. Moreover, the original electronic instruments don’t seize me with affection or nostalgia, per se: My softsynth emulation of the Synthi AKS doesn’t start to go out of tune the when I turn it on like the one I messed with did, and I don’t have to worry about losing those little pin things. My Mellotron plug-in has a few more tape banks (cough cough) than my original, and is three or four orders of magnitude less fussy and high-maintenance than its physical counterpart. Finally, I can afford the things without having to sell my house or car. But that also means that putting out another virtual subtractive synth is a daunting proposition. You’d better have something going for you. Let me introduce you to a virtual subtractive softsynth that has someone going for it, indeed: The u-he Repro-1 – a component-level modeled softsynth version of Dave Smith’s Pro-One synth that beautifully balances respect for the original with features that take it well beyond it merely being a mere attempt at recreation. If you’re familiar with any of the other u-he softsynths (see, for example, Mark Mosher’s excellent walkthrough of their Bazille ), then you already know what I’m going to mention as the first selling point: The Repro-1 sounds flat-out jaw-droppingly astounding – even more so if you knew the original. If you do have any memory at all of working with the original, all you’ll need to do to be converted is to sit down and run through the original 1980s preset bank that comes with the Repro-1 with your headphones on and your eyes closed - after that, the only stuff I can tell you about is a small number of features that correct what might have made you a little crazy about the original. It’s that simple. It sounds that good (before you reach for your credit card, you’ll still want to read through to the end of this piece to find some exciting surprises for you, too). If you’re not an 80s synth geek, here’s the elevator version of the Repro-1 in Standard Synthspeak: It's a dual oscillator monophonic synth (saw/pulse on oscillator A, saw/pulse/triangle on oscillator B) with a four-pole (24dB/octave) resonant lowpass filter which tracks the keyboard and can self-oscillate, an interesting and robust set of modulation options, along with a nice built-in arpeggiator and a step sequencer. The Sequential Circuits Pro-One was a subtractive synth contemporary of some synths you may know better: the SH-101, the Moog Prodigy, or the Korg MS-20. While it was initially introduced as the monophonic cousin of the considerably more ambitious (and pricey) Prophet-5, it came to be loved by some of us for its great modulation options and the inclusion of that aforementioned arpeggiator and step sequencer. The beautifully designed UI made working with it quick and intuitive, and it sounded really good. Thanks to the ubiquity of access to 80s music, you can still hear the thing slicing, stabbing, or bouncing its way through all kinds of recordings by Vince Clark (Depeche Mode, Yaz, Assembly), Carl Craig, Front Line Assembly, and New Order, among others. I loved it and used it myself, back in my now-slightly-embarrassing Cassette Culture guy youth. 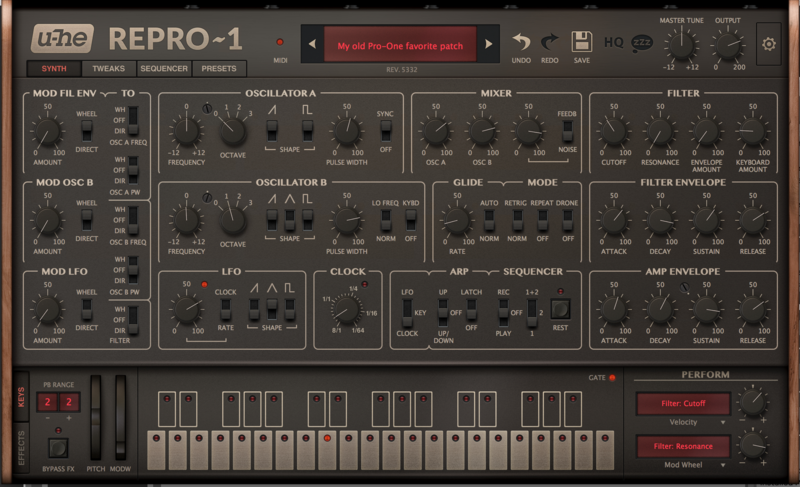 Unlike its physical counterpart, the Repro-1’s got a tabbed interface that allows u-he to stick with the clean and well-designed Sequential Circuits-style front panel layout and still allow for easy access to their bells and whistles (the TWEAKS page and the SEQUENCER control panel, along with the browser for the several hundred presets that come with the device). The SYNTH page gives you access to the synth’s basic functionality - oscillators, envelopes, and basic performance parameters. It’s all about the two oscillators - oscillator A outputs saw and/or pulse waves, while oscillator B generates saw, triangle and pulse waves. Each oscillator’s pulse waves have settable duty cycles, of course, and oscillator A can be hard-sync’d to oscillator B. If you need a second LFO, you can use oscillator B’s Lo Freq setting to drop things to sub-audible speeds. A mixer section lets you blend the oscillator outputs, along with adding white noise generator (which works well with that self-oscillating filter) and a feedback circuit for extra bass and timbral crunchiness. The modulation options available you as you program voices is one of the places where the original Pro-One really distinguished itself as a synth. The modulation options on the Repro-1’s SYNTH page are precisely the same as the well-designed and laid out original Pro-One. You’ve got an ADSR hard-wired to the output amplitude (whose curve you can adjust) and three routable modulation sources: the filter envelope, output of oscillator B, and a host-syncable LFO that’s got the same mixable waveforms as oscillator B. Working with this modulation scheme quickly becomes second nature, and it’s one of the reasons the Pro-One was a success. But the Repro-1 has made an improvement in what was already pretty amazing: they’ve added two additional modulation options. Clicking on the Perform button section next to the keyboard lets you adds a pair of open-ended modulation pairings, linking two from an assortment of sources (aftertouch, amplitude envelope, expression, gate, key follow, LFO, trigger, velocity, wavefolder envelope, etc.) to any synth and effects controls in the Repro-1 using simple drag and drop. One of the distinguishing features of the original Pro-One was the inclusion of an arpeggiator and a step sequencer, which greatly extended the functionality (and fun) of the basic monosynth. In situations like this, I aways wonder how a company will treat those features, which are so much easier to implement in software - will they re-invent history, or opt to be faithful to the original (with maybe a fix or feature or two added)? A look at the Repro-1's arpeggiator and sequencer answers that question pretty well. The Repro-1’s step sequencer varies in one big way (it gets its own programming window instead of an non-visible memory) and several small ones - it expands the number of steps from 40 to 64 (two banks of up to 32 steps each) and it adds the ability to include per-step velocity, tie steps, and a rest button you can use to add spaces when you’re doing step-recording. Those minor changes really add up to be big improvements. Sure, those original 4-pole filters sound wonderful, but you might also be interested in investigating the included "rounded" or "driven" alternatives. I think you'll be surprised at the range of modifications that these options offer you (I'd say that they tend to give the Repro-1 a more "modern" subtractive sound that diverges from the original instrument, but your mileage may vary on that one). Who doesn't love a stompbox or five? The effects are displayed in a fixed order, but you can rearrange the actual order of processing by dragging and dropping their bypass buttons up and down the effects chain. The effects are uniformly great sounding, and a really nice addition to the package. As someone walking you through a piece of software like this, I always feel as though I am supposed to find something to take issue with or request as a feature. Frankly, that's very difficult to do in this case - I'd normally have found some minor problem I had with my Pro-One back in the day and complain about the fact that it's not been fixed in the plug-in, but that's not going to work. If anything, they're not only fixed the stuff that bugged me, but they've added things I wish the original had in the first place. There is a trade-off for the kind of spectacular verisimilitude that their component-level modeling gives them - the Repro-1 eats some CPU. That's true of their Diva as well, and - frankly - I'm not too concerned. For me, the sound justifies everything: When recording, I'll just render the MIDI tracks as audio and move on when working with large multichannel sessions. Since I don't make Max patches that run on the bleeding edge of CPU usage, I can judiciously include ravishing softsynths. When I sat down and added it all up, I was really impressed with the Repro-1. In fact, the only little niggling thing I could come up with as a shortcoming/feature request was something that any of you who know me or my work will see coming a mile off: The Repro-1 I tested didn't support microtuning. That's a little curious, given that their other products (Diva, Bazille, etc. ) do. I figure that it's a pretty spectacular product when all I can think of to criticize is the lack of microtuning support. So I reached out to their Customer Support guys and mentioned this. I heard back from them quite quickly - there's an update to the Repro-1 on the way, and it will support microtuning in the same manner as their other products. Yes, there’s a Repro-5 on the horizon. In case you haven't guessed, the Repro-5 is to the Prophet-5 as the Repro-1 is to the Pro-One, and it's its own beast (although it shares u-he’s standard commitment to component-level modeling). You can already glimpse a bit of it in the Repro-1’s TWEAKS page, where you can use their Prophet-5 oscillator model in your Repro-1. When it appears, the Repro-1 and Repro-5 will become a bundled product. And anyone who owns a Repro-1 will get the Repro-5 for free. In addition, the folks at u-he tell me that there’ll be a pre-release introductory period where where people can get their hands on the bundle for the current (old) Repro-1 price. The Repro-5 will be public beta during that time. When the official release of the bundle happens, the price will go up. You might want to keep that in mind. Not when you use them with our Gig Performer product. I've completrly stopped using VSTs with Max and instead I use it to send processed MIDI events to Gig Performer over OSC.